Strickler Planetarium, located on the campus of Olivet Nazarene University in Bourbonnais, Illinois, is a state-of-the-art digital planetarium dedicated to educating the public about the natural world. The planetarium, constructed in 1967, has recently undergone extensive renovations, the centerpiece of which was the installation of a new Evans and Sutherland Digistar 3 SP2 HD digital projector. This projector has all the capabilities of the previous opto-mechanical star projector as well as exciting new multimedia and full-dome video capabilities. Audiences are immersed as never before in a three-dimensional visualization of the night sky, the solar system, the galaxy, and beyond. The Digistar’s stellar database means that simulated travel through space is more than simple special effects — it’s an actual journey through an accurate model of our stellar neighborhood. 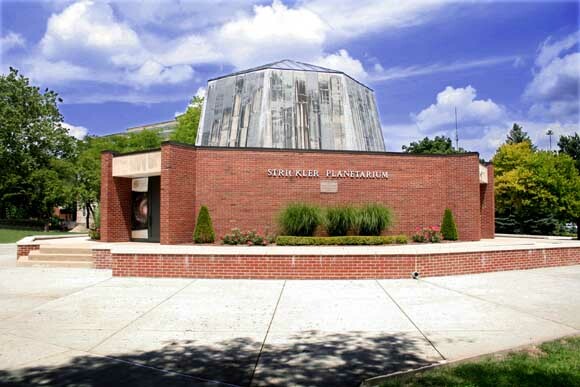 Strickler Planetarium is one of only three planetaria in Illinois with digital projection capabilities. Witness the history of the universe from its fiery birth to the formation of our solar system. Explore colliding galaxies and the dusty reaches of our own Milky Way. Take a tour from our own night sky to the edge of the solar system. Our science educators and our multimedia tools make this all possible from the comfort of your seats. Come and see the new Strickler Planetarium.